It’s been a while since I’ve been able to do anything writing related, including update this blog. But there has been exciting news! First of all, We See a Different Frontier is now available at Amazon and Barnes and Noble, among other places. Please support this much anticipated anthology! 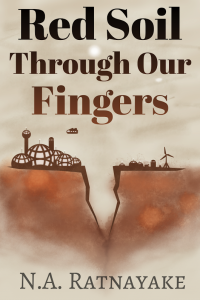 This anthology of speculative fiction stories on the themes of colonialism and cultural imperialism focuses on the viewpoints of the colonized. Sixteen authors share their experiences of being the silent voices in history and on the wrong side of the final frontier; their fantasies of a reality in which straight, cis, able-bodied, rich, anglophone, white males don’t tell us how they won every war; and their revenge against the alien oppressor settling their “new world”. But this does not mean that the collection is one-sided or polemical. I have been alternately intrigued, challenged, angered, and inspired when reading this anthology. Nalin has written the short story “Remembering Turinam,” a complex story which spoke to me on many levels. It is a sad story about a meeting between a young man and his grandfather. Also, the idea of language as a tool in colonization is strong in the story, something I believe to be very true. One thing is a dominant military force, but the silent conquer through education, language, culture, is perhaps even more brutal. Like the editors Fabio Fernandes and Djibril al-Ayad write in the introduction in the anthology: «That suppression of culture and especially language are common tactics in the repression of a people, and as effective as violence itself.” I really liked how Nalin weaved the plot around this. The story gives much food for thoughts and pondering, which I love. I’m so happy Nalin took the time to answer some of my questions. You can read the interview in full over at her blog. A complete listing of publication venues and reviews is available from the editor’s blog at The Future Fire.